Are Bare Knuckle Pickups any good or are they dud? Do these pickups sound good? and what about 'scatter wound' does that affect the tone of my guitar? 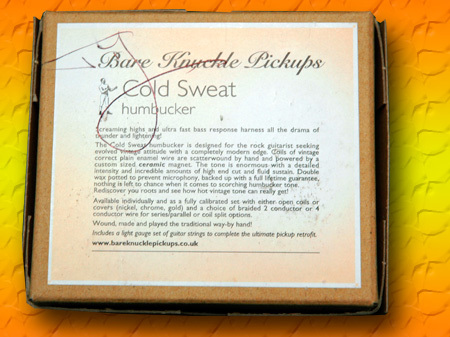 Find out in this review of hum bucker BK pickups I bought. A while ago I visited a music show in sunny Birmingham England (actually in the rain and fog) to have a look around and get some new pickups for an Ibanez guitar I picked up from the USA. The guitar already had some Dimarzio units in there but I did not particularly like the sound at the time. Wandering around the show I found the Bare Knuckle Pickups stand, and one guy called Tim, who knew what he was talking about (for a change). I asked about some pickups and explained what style and sound I was looking for; basically a tight and defined bottom end and great mid range. 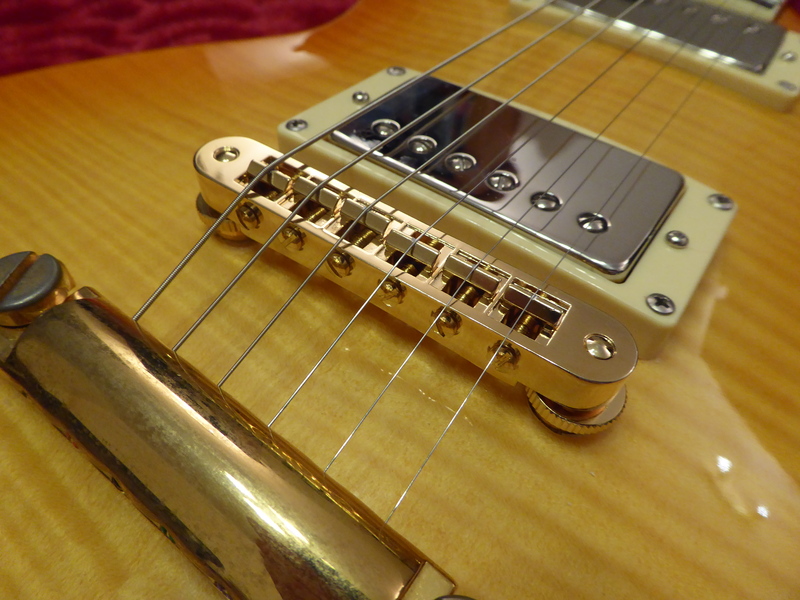 Tim recommended the 'Cold Sweat' model of hum bucker's (they gave me a cold sweat about how to pay for them; they were very expensive for a couple of pickups) so I bought a matched set at a cost of £180.00 pounds; that's $US250 to everyone else; man these were really expensive. Now this brand is sold on the basis that it is scatter wound just like the original end of 50's pickups and have a wonderful sound so probably like many customers I was hooked. The cold sweat pickups are sold as QUOTE 'Evolved Vintage Attitude with a Completely Modern Edge'. These use a ceramic magnet so you're going to get high output, so I would not be looking for a clean sound particularly from this set of pickups. OK, now a little bit of education. When pickups are made today, they are either scatter wound or machine wound i.e. black or white (and I don't mean colour!) so each type of winding has a distinct effect on the sound and is very different in reality. 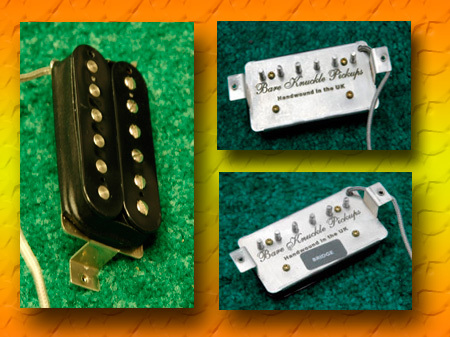 Check out bare knuckle pickups HERE or Seymour Duncan Pickups HERE or Dimarzio HERE. The basic difference is how capacitance affects the sound output from the pickup; and the winding type directly influences the sound. 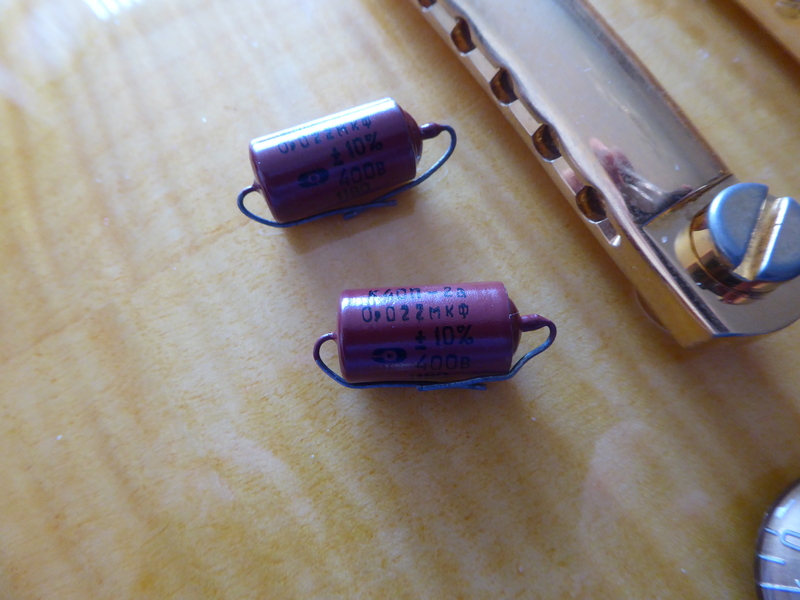 If you have a scatter would pickup, and another made exactly the same, except that the winding is machine wound (nice and even) then the difference is that the scatter wound pickup will have much more top end; it's as simple as that. 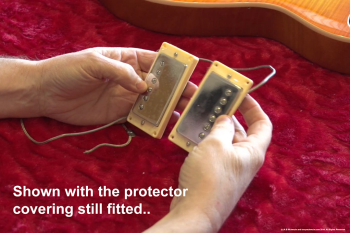 Capacitance (or even capacitors) dull the sound if the capacitance is increased and brighten the sound if the capacitance is reduced; in the case of scatter wound pickups, because the windings are usually away from each other i.e. not lying next to each other the sound has a decidedly more top end output. Lesson over, now we have some idea what we're talking about. Scatter wound = top end, machine wound = less top end - in the simplest form. OK So far so good, so how were the 'cold sweat' pickups for me? Actually, if you listen to some of my music when tapping guitar and using a wah pedal in a particular way I achieve 'my' sound. I guess it's not unique, but I have not heard anyone play exactly like me; so it definitely is 'my' style. I returned home from the music show and proceeded to fit the cold sweat pickups in to the Ibanez. The wiring diagram provided in my view was poor, but on the Seymour Duncan site there were some excellent wiring diagrams; a little change on the colour codes and these diagrams worked fine. Thanks Seymour. No doubt Bare Knuckle Pickups will update theirs. I tested the guitar with three different setup's; Mesa Boogie Triaxis and 2:90, an Engl E670 special and a Marshall TSL2000 100 watt amp. From each amp I found that when I used the guitar fitted with cold sweat pickup's that the top end was way over the limit for my style; remember I use the wah for the tapping. The result was that no matter what volume I played at (except nearly no volume) I had unwanted feedback through the amp; and changing my sound this much was simply not for me. This is not particularly a criticism of the cold sweat pickup's as they do exactly as described. But if you think you like top end then my own view is that when you try these they may well have more top end than you bargained for. The quality of these pickups has never been in doubt; Tim and his team's manufacturing standards are as good as any company in the world. It's just that for my style I could not ever make these work. 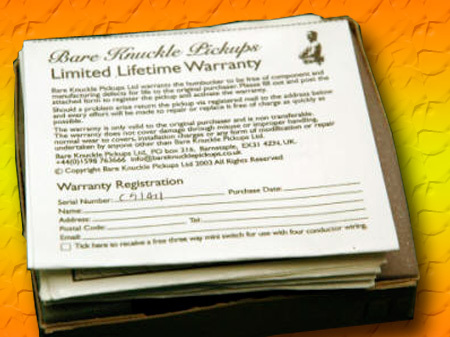 I called Bare Knuckle Pickup's because they have a 14 day exchange policy providing you have not cut the pickup wires down; lucky for me I had not and unlucky for you if you have. Tim recommended a set of 'Nail Bomb' pickups instead; described as less top end but still reasonably tight bottom end; the description at least was inviting. The nail bomb pickup's were alnico magnets too thus probably lower output. I returned the cold sweat's and duly received the nail bomb pickups by return; thank you Bare Knuckle Pickups for doing exactly what you say you will. Some suppliers don't always do that. What were they like? Well these were much improved over the cold sweat units by way of reduced top end just as Tim said so good so far, but the top end was still (at least for me) too much for my style. These remain in the Ibanez at the moment. Again the build quality was excellent, but I just can't quite do with the feedback when I tap in the way I do; so these will be destined for eBay I'm afraid. Again this is not particularly a criticism of Bare Knuckle Pickups (the company) but more a 'take heed' notice to would be buyers; just make sure that the top end is not too bright for your style. I guess I could have harassed Tim to change these as I know he would have; but I could go on all day and maybe a fair number of sets until the ones that suit my playing appear one day. These pickups carry a limited lifetime warranty to the original buyer so they are manufactured as top end units. I really like companies that stand by their products in this way, it shows a massive commitment from any manufacturer. Bare Knuckle should describe pickup names in a much better way the title 'nail bomb' for example says nothing of the sound of the pickup a major problem in my view for prospective buyers. I liked the way that BKP changed the units; not unique, but really good customer service. Well done BNK and Tim. Although I eventually sold these pickups that was no reflection on the company and their service is hard to beat especially if your playing style is a bit less mainstream like me. Recently I bought a set of 'The Mule' pickups from Bare Knuckle Pickups to fit to a really cheap guitar so that I could 'upgrade' it from Wilkinson (they claimed) hum buckers. I bought these new pickups from a show here in the UK that is really one of a handful left that come back each year. Having used BK pickups before I was a little concerned about actually buying them, but Tim the owner was going to demo them on stage later in the day so I planned to go and see if these BK pickups were as I remembered them as above or was there something new that I had been missing out on. It's true that you always see good comments going on where BNK pickups are concerned and I wondered if I had been a little too harsh in my previous review. In any case Tim was due on stage so I ventured up there with a few friends to watch what Tim could offer us by way of different tones from how I remembered them. I was looking for a set of 'The Mule' pickups... very similar to regular Gibson early 60's or thereabouts and Tim played in his band onstage showing how they sounded in a musical setting. He was very impressive. Later I returned to the show and located the BK pickups stand and located a sales guy (well he did seem keen to grab me). I explained that I was looking for BK pickups that were as near to regular Gibson pickups as I could find - explaining that I had used the brand before but sound them very toppy (as above). He suggested that I bought some of 'The Mule' (a set) which I did... but man those were expensive pickups. They cost me around £210 for a set but they did throw in a tee shirt as a show special so I'll get to use that later in the video review. So now I had pickups fit for a king... well hopefully! When I got hold of the guitar I wanted to fit them to - a Harley Benton (Thomann £125) SC450 model it had its issues which I had to fix (check the review of that on this site presently you will be shocked) and then fit these pickups. Fitting BK pickups is a pretty easy task especially these ones as they are NOT 4 wire type but rather like the older Gibson hum buckers with a cloth insulator and braided metal shield - just like what Gibson used forever. Above is a picture of the pickups after I worked them in to the surrounds and just prior to fitting in to the 'donor' guitar carcass. I used some 0.22 capacitors for the guitar but once it was all fitted the guitar looked just as it did before but with those bright new 'nickel' plated pickups fitted. 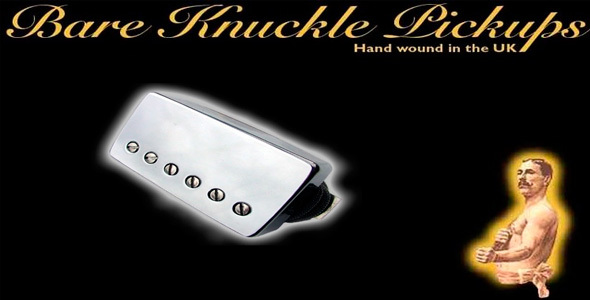 Everything about the Bare Knuckle pickups reeked of quality.. but let's face it for that cost they should do. They fitted the guitar perfectly too. Always remember not to cut the wires until you are happy with the pickups and then Tim and his guys will change them for other models if you don't like the ones you bought... just as before really. And that lifetime warranty still applies in 2016. These pickups remain scatter wound as indeed the others above were so I half expected a 'toppy' pickup tone. Indeed they were far better to my ears than the original review pickups but they still have a small amount of extra top on the tones but not in a bad way - so I would describe this model as more laid back in that department. Good! The tones were near enough what I was looking for from these pickups so I can actually recommend these if you don't want your pickups (what seemed to be) over bright as in the previous models I looked at those years ago - and that for me is a good thing. While the cost is probably too high for some musicians if you are picky on quality then these will be the pickups for you - and Tim and his team will stand behind them if anything goes wrong later. As always on BK pickups I still have that issue of a 'dodgy' naming description - and even while buying them the guy never really said that they were like earlier (59-60) Gibson hum buckers so bear all that in mind. So this time I'm keeping these pickups and will no doubt at some stage find a better donor guitar to fit them in. As a score out of 10 I give these an 8 which for me is actually a very good score... holding them back a little is slight toppy tones, the pricing and those darned pickup names. If none of that bothers you then you're on to a winner. Recommended. Thank you for visiting my website and come back soon. © A B Mckenzie unless specified otherwise so do not copy without written permission.